Tree House's Double Shot coffee stout has gone through numerous variations, each one experimenting with different types of coffee. Tree House's description on their website says that this version promises to be the most intense and potent yet. Now, that's a bold statement. Pours nearly pitch black with dark brown and ruby red on the edges. Got about a finger of a brownish, cocoa-colored head. The aroma is not as roasty as other coffee stouts I've had. This is huge on the espresso and bitter, dark coffee with some hints of cocoa powder. The two biggest flavors I pick up are the aforementioned espresso, but also a significant molasses taste which would explain the sticky feel. Some nice, fluffy milk chocolate adds to the complexity too. Hidden in the back is even some cinnamon. Nothing is really subdued as all the flavors are intense and make your eyes widen. The mouthfeel is so soft and inviting. Every sip is like a tiny hug. Too much? Ok, but still, it is velvety and fluffy. No alcohol presence at all and this drinks as heavy as an imperial stout. Coffee and molasses are sticking to the roof of my mouth and my tongue as I repeatedly smack my lips. This version of Double Shot brought more sticky molasses and light milk chocolate, but still retained the super rich gourmet coffee that has become the series' trademark. 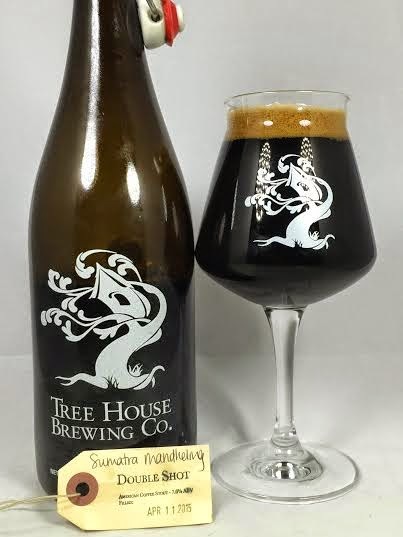 Tree House is arguably making some of the best (if not THE best) coffee stouts around and this chocolate and cocoa-filled variation makes a divine desert beer after any hearty meal.